This pilot study examined changes in cancer-related post-traumatic stress symptoms (PTSS) across time for siblings of children with cancer. Siblings (N = 32; aged 8–18) completed a measure of anxiety, the Child PTSD Symptom Scale (CPSS), and the PTSD section of the Structured Clinical Interview for DSM-IV-TR (SCID) at twelve (SD = .9) and eighteen months (SD = 1.3) post-diagnosis. Moderate-to-severe PTSS was reported by 12 siblings (38%) at T1 and 7 (22%) at T2. 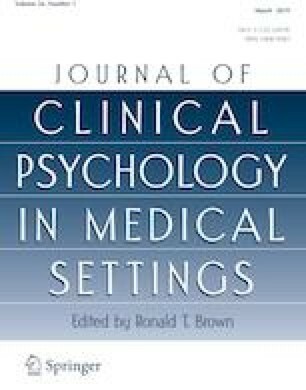 Cluster analysis of PTSS data revealed five patterns: Few symptoms, stable across time (31%, n = 10); Mild symptoms, decreasing across time (16%, n = 5); Mild, stable symptoms (28%, n = 9); Moderate/severe symptoms, decreasing across time but remaining moderate (19%, n = 6); and Moderate/severe, stable symptoms (6%, n = 2). SCID data and anxiety scores distinguished siblings in the final two clusters from those with more favorable PTSS levels/trajectories. Additional research with larger samples is needed to validate these trajectories and examine factors that distinguish siblings with consistently elevated cancer-related PTSS from those with mild or significantly improving symptoms. Portions of these data were presented at the Society of Pediatric Psychology Annual Conference, April 2013, New Orleans, LA. The authors thank the families who participated; Janet M. Hock, Ph.D. for her support; and Craig Lodis, Ph.D., Caroline Stanley, Ph.D., Joanna Cohen, Ph.D., and Hinette (Shelby) Rosario for their assistance on the project. This work was supported by US Army Medical Research and Materiel Command research contract USAMRMC No. 0704400, PI: J.M. Hock. Melissa A. Alderfer, Beth A. Logan, Stephen DiDonato, Leela Jackson, Marie J. Hayes, and Sandra T. Sigmon declare that they have no conflicts of interest. All procedures performed in this study involving human participants were in accordance with the ethical standards of the institutional research committee and with the 1964 Helsinki declaration and its later amendments or comparable ethical standards. This article does not contain any studies with animals performed by any of the authors.